The ancient town of LiJiang, in YunNan province, is a UNESCO World Heritage Site, with over 800 years of history. It was an important hub of the South Silk Road, along which many items were traded, including tea. It is home to the NaXi ethnic minority. LiJiang has lots of boutique hotels and cosy hostels in traditional architecture. The town, with its cobbled streets, streams and bridges, features many crafts (embroidery, silverware, drums and more) plus a wide variety of street snacks and restaurants. A water town in north-east JiangSu province, not far from Shanghai. 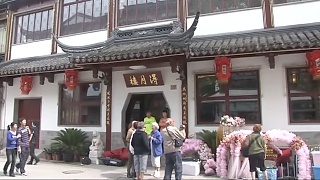 SuZhou Old Town is famous for its gardens as well as canals. The classical gardens are on the UNESCO World Heritage Site list. The peak of the mountain range is 5,600 meters. The view of the mountains from the gardens at the Black Dragon Pool (HeiLong Tan) in LiJiang is regarded as one of China's finest. On the far side of the mountains lies Tiger Leaping Gorge (HuTiao Xia). LiJiang is a city with nearly 1.5 million inhabitants, yet LiJiang Old Town has the architecture and atmosphere of times past; indeed, it is a UNESCO World Heritage site. The Old Town, with its waterways and ornamental bridges, dates back over 800 years.